My chapter - Beyond the View: Reframing the Early Commercial Photograph has recently been published in Ingleby and Kerr's, Coastal Cultures of the Long Nineteenth Century, (EUP, 2018). The collection examines the cultural importance of the coastline in the nineteenth-century British imagination and my own chapter reconsiders the very early trading photographers working at the water's edge. Reflecting on the innovation of their practice and how more broadly commercial photography rapidly provided a democratised means of portraiture. Given the panel I am on, I do feel the requirement to foreground my diverse working life as a: photographer, curator, director of an archive, co-director of a centre for research on communities and cultures, co-editor for the Journal for Photography & Culture… and ah!, yes! as a writer too! For me, certainly since 2010 (I came to photography rather late in life) the interchange between writing and practice (and by practice I refer back to particularly the making of photographs and the curation of both photographic festivals and exhibitions) is seamless. These activities are not discrete from one another, but inform each other and for me personally distill experience rather than dilute. when asked to speak on one of the subjects – in this case writing - I feel uncertain and somewhat exposed – I fear what might be expected is mastery in one, when I can provide at best proficiency in some. Unlike the elephant I play neither piano nor flute, but to extend the orchesteral analogy perhaps to breaking point – I think of my working life as being akin to a percussionist, working across instruments which whilst perhaps appearing highly diverse, do indeed share a strong family relationship. My life is lived as a coastliner – at the very south east margin of the UK, closer to Europe (at least now geographically) than to any city – certainly London. I live and work as Fay Godwin’s 1995 book is titled at The Edge of the Land. My home is on the Isle of Thanet which is perhaps best known for its coastal towns of Ramsgate, Broadstairs and Margate which make up the Isle of Thanet. I am within and part of that complex coastal community which very recently has found itself in the bewildering position of being back in fashion – in reality Thanet is a place which has endured decades of decline and disregard. Living and working at the edge made me want to find ways of telling the stories of coastal communities such as mine – and in the telling contribute to a recalibration of perception of this place and space. How might I use everything in my intellectual and creative armoury to at least have coastal communities such as mine acknowledged. Today I will talk about how as a maker of photography – and a maker in the broadest sense - as a writer, photograher, curator etc, - a hybrid - a mongrel, I mediate and in doing so I re-member and re-shape an actuality. In doing this I’m going to draw upon a range of seaside imagery and writing. For me, photography-as-writing provides a potent conduit for harvesting and then telling stories about other things – things that matter to me and by mediating re-membered experiences through the medium of photography and photography-as-writing I aim to make coastal lives connect with others – usually using the photograph as object, cloaked in words, generating a connective tissue between a re-membered, usually a demotic experience - and its re-telling to others. and seek to engage with the public through coastal community gatherings and events - it is these gatherings which has led to the findings explored in the first 2/3s of this presentation. As I hope we shall see, commercial seaside photography – which could so readily be defined as prosaic and ephemeral - has not only endured, but reveals an unexpected, unintended, emotional potency. This type of production was present from the mid C19, but it is these mid C20 photograhs where my initial focus today resides, by this time commercial seaside photography was a highly systematised process, based upon the division of labour and a capitalist model of, crudely speaking: stack ‘em high / sell ‘em cheap. This was characterized by young, often very attractive – normally male - summer-season photographers - as we see here X2 - being employed to photograph people enjoying the promenade and beach. If photographs were not sold and thus kept by the buyer at the time of taking, they would routinely be discarded or pulped by the photographer/photographic company, with no archive or record kept. We at the Archive – at SEAS Photography - have sought to counter this lack of record and in an attempt to uncover, document, exhibit and write about these privately held pictures, we have organised numerous Community Collection Days. Here members of the public can see examples from the Archive, bring along their own commercially taken seaside photographs which are scanned and at this point we attribute names and importantly any additional narrative information such as dates and whereabouts. It is very seldom - I can count on the fingers of perhaps one hand - how many times a donor has allowed us to actually keep the postcard photograph – rather than just take a digital copy. Indicative perhaps of the emotional – not monetary - value such material objects have for the individual families. Five years ago and new to the role as Archive director, what I hadn’t envisaged was just how significant these humble objects were to their owners – which at the time of production would have cost just pennies to buy. I also had to quickly understand that each image-donor told the picture’s narrative, not as history – but as memory. Perhaps not an accurate memory – but nevertheless recounting the narrative as if an important memory. Maurice Halbwach’s persuasive thesis is I think salient here, drawing as it does a distinction between that of history and that of memory. At the Archive we have become very aware that for the image-donors their contributions are not considered by them as ‘history’ – they’re neither a formal nor a written account mediated through an academic or official lens. These modest material objects are potent visual connective tissue linking the donor to their, or their families, (re)membered past. The connective tissue between their reality of now and their (re)membered experience of then. It is inevitably a selective and reconstructive process, where distortion of narrative, of editing of fact does take place, whereby (re)membering a past rather than ‘The Past’ and a truth rather than ‘The Truth’ is produced. A past and truth made all the more binding through the act of telling at the community events. But of course in the harvesting of these tales I also risk hijacking them, as I place them into an academic context though writing or in presentations such as today. and I too am touched too by the stories I hear – it is touching to witness. that of Mr and Mrs B, who travelled on a bus to one of our community collection days. They then patiently waited for over an hour to have a single image scanned – this image. 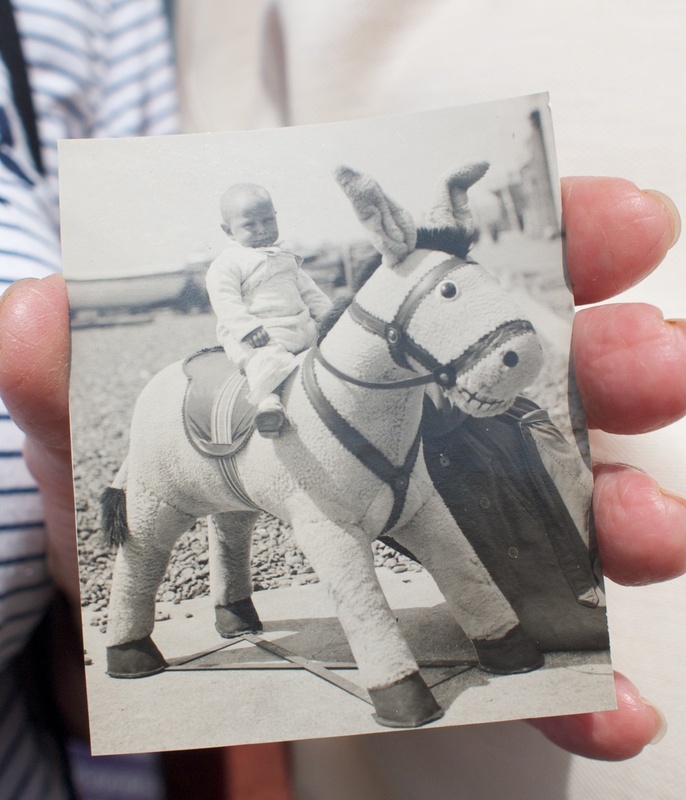 We have loads of these – commercially taken seaside photographs of small babies on ersatz donkeys. But each one is someone’s baby; each one is the connective tissue between their now and their then – between the now and the (re)membered. Mr and Mrs B’s baby died – this is one of the very few images that they have of her – they have only three photographs of their baby. The poignancy of the picture is of course amplified with this knowledge – their generosity in sharing this image and their memory of that specific day – the day, the moment that this photograph was taken is made all the more acute. Of how that day had felt – a bright day, but still fresh enough to require them both to wear gabardine macs and for the baby to have hand-knitted layers on. Of how Mrs B had wanted the image to be ‘just of the baby’ and so had crouched down to the side, supporting the infant - at once she as mother, is present and yet concealed. Mr and Mrs B’s spoken memory was a song well sung. And I took their narrative, as I scanned their image, as I touched the photograph of their baby daughter, I couldn’t help but feel emotionally moved and this emotion was heightened still further as I handed the photograph back to them – whereupon they in-turn touched it / stroked it – as if a relic. This gesture of ‘touch’ I’ve subsequently seen over and over again at Community Collection Days. Mr and Mrs B’s story was of course edited, their memories are edited / selective / re-membered versions of a past - in a similar way I too, in recounting their story here, edit / select and re-member. As I noted earlier, I theoretically comprehend what I witness at Community Collection Days, but find the experience to be not only academically engaging but frequently emotionally touching too. And then… and then… a few months ago my Mother died. Now, the peaceful death of an 80 year old woman cannot be defined as tragic, in the way that the death of Mr and Mrs B’s little child can be seen as such. But to loose one’s mother, regardless of how grown up we are, can inevitably bring deep sadness, mourning and in these relatively early days for me an emotion utterly akin to nostalgia in perhaps its original sense – a homesickness or longing – a longing for my mother’s corporal form. I quite literally miss her body. this 1950 commercial seaside photograph of my Mum, seen with her mother my Grandmother - at a time which is prior to my own existence. Here my Mother is just 14. I initially thought she was older, but the photograh was dated and through this unique commercial code – seen here – I can tell where it was taken – the small seaside town of Birchington which is close to where I still live and work. As I held this unexceptional commercial seaside image, I became aware that like so many of the donors to the archive, that my fingers too were tracing my mother’s body, my own perhaps paradoxical maternal instincts wanting to be gentle with this diffident, gangly, awkward teenager. I repeatedly came back to the out of focus shoes here in the bottom corner – are they hershoes..? I suspect so, but this makes me ache to an irrational level, as they appear to be such pragmatic footwear, she would have loathed them - she loved only pretty things. And her gesture – both facial and physical – floors me - I had seen her repeat this gesture only a month before her death when we attended a first and last meeting at our Hospice and her consultant tenderly told her, her life would be spent in a matter of weeks. She rocked forward, she clasped her knees, she smiled this exact same awkward smile - and thanked him. Such behaviors signify a value, an emotional connection, indicted by the tenderness in which the images are held, or the pride in which they are presented, or even in the way in which the donor might actually stroke the picture as relic. These commercially taken seaside photographs have a material potency – a material potency which arguably punches way above their weight and far supersedes both the picture’s actual monetary value and any original intentions on the part of the commercial seaside photographer. Much of the 2015 summer was spent walking the Thanet coastline with my camera. It sounds idyllic: waking, pulling on shorts and tee-shirt and straight onto the beach. ‘Idyllic’ is almost an accurate description. This part of my life has a beautiful simplicity – childlike rather than childish – playful, redolent of summers past. But in August 2015, the events shown in the image above served to reveal the denser undergrowth of photography. However, research into seaside photography has taught me that being a beach-photographer – or a photographer who locates herself on the sands - has never been without difficulties. We naively think that this is the age of camera-suspicion, or more accurately, suspicion of the photographer’s motives. But history suggests otherwise. Mid C19 seaside photographers plying their trade through cheap, while-you-wait photographic portraits were routinely characterised as ‘bodgers’ or ‘smudgers’, descriptive terms signifying a generalised ineptness and beyond this, a questioning of character. While something of an exaggeration, the grain of truth is magnified in our contemporary era by further complexity: where suspicion is amplified through a general cultural anxiety around motivations for image making and image distribution and heightened further when children are included in the frame. The camera and thus the photographer in certain contexts can become, in Steinbeck’s assertion, ‘weaponised’; a threat amplified in contexts where states of undress are the norm and where children are at play. Nevertheless, children are included in my image making. A continual delight for me, through my location at the seaside, is seeing ‘free range’ children, typically beyond the reach of structured parental-led activities. On the sands I observe, regardless of nationality, race or gender, children choreograph new friendships, share beach paraphernalia such as spades, buckets and simple fishing nets and how they play in parallel and together at the water’s edge. It is at this edge where I make my pictures. But in the summer of 2015 something changed. In one moment I unselfconsciously raised my camera to make a picture and in the next a small, unnoticed child standing to one side pointed to me and cried out ‘Paedo!’. Within an instant a cluster of nearby children joined the chorus of “Paedo!, Paedo!”. In that moment, I realised that no public alarm was more piercing than that particular chant. My camera came down and I flinched, at both the alarm call and the anticipated approach/reproach of the parents. I regretted too the cultural implications of such young children having this abbreviated word in their vocabulary. I was to learn over the course of the summer that this epithet is shared across many European languages. After that incident I developed what I can only define as a photographic stammer. I would head off each day, but return without even having lifted the camera. Or I would hesitate in bringing the camera up and so miss the picture. The ripples of the chant were still there. But a timely visit to the Photographers’ Gallery and Shirley Baker’s exhibition ‘Women, Children and Loitering Men’ proved therapeutic. Baker used a TLR, and with good reason: the TLR camera unlike a rangefinder remains low, the photographer’s face remains visible and a conversation can continue whilst pictures are being made. I headed back out with my own ancient TLR and felt utterly liberated. Such a seemingly simple change meant that not only was I making pictures, but felt empathetically (re)connected to those I was photographing. So it was on a hot dry day in August 2015 I found myself on Margate sands. I was in a light mood, carrying the TLR along with an unobtrusive digital compact and talking to people on the beach with my former ease. Suddenly a man collapsed and appeared to be in a very bad way. It quickly became apparent that things were critical. I sat, perhaps just twenty-feet away and along with many others watched how the young lifeguards with a doctor who happened to be on the sands and then the swiftly arriving paramedics worked tirelessly to save this man. His heart had stopped and the medical team kept going while his family of several generations gathered nearby in shattered, dignified silence. During this time people stood and watched – I watched – and then to my left I saw a man, dressed for the beach, stroll into the scene and in a moment his long lens went up. I watched him for a while as he shot in rapid succession. Then, to his right, a group of young men whom I had earlier seen playing beach football clustered together, one of them pulled out a mobile ‘phone and took a group ‘selfie’, their pose carefully angled to allow the unfolding action to be in their pictured background. Yet I too photographed this scene and later wondered about the doubly ironic notion of whether capturing an image of photographic voyeurism is also itself voyeuristic. To retreat from what I had seen, I wandered to my favourite coastal spot, far from the crowds of Margate’s main sands. I stayed there for a long time and as the sun set I saw a young father take his small child into the shallows for a final dip. The sun was now so low that they stood in the last beam of light. He was using his mobile ‘phone to photograph his child. He lovingly teased her to make her chuckle, their joyful chatter in a language unfamiliar to me. Almost involuntarily my camera came up and I took the scene. In many ways the image was of course clichéd, except for that moment reminding me of how the coastline’s edge photographically cuts both ways: from the misanthropic to the empathetic image. The most hostile act I had experienced on the beach had not been aimed at me; it was not the protective mother signalling that the camera was unwelcome, nor children taunting me with cries of ‘paedo’. Rather, it was witnessed by me, where the public death of a man became the focus of the photographic long lens and a seaside selfie. specifically, the seaside as location. This illustrated paper drew from the UK’s South East Archive of Seaside Photography to (re)examine how commercial seaside photography has not only endured, but reveals an unexpected emotional potency. Commercially taken seaside photography was established around the UK’s coastline by the middle of the 19th century and by the mid 20th century was being produced on an industrial scale. Yet despite mass production and the connotation of such photography as little more than disposable seaside ephemera, these images in the form of ambrotypes, ferrotypes and later postcards have endured. We know that thousands of these photographs were taken and yet most of these images are now found only within the domestic family album. If photographs were not sold at the time of taking, they would routinely be discarded or pulped by the photographer, with no archive or record kept. This paper will reveal how to counter this lack of record and in an attempt to uncover and document these privately held pictures, the South East Archive of Seaside Photography organised numerous community collection days. 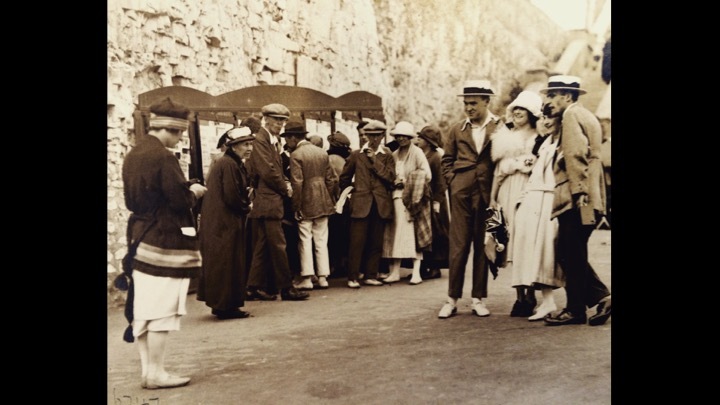 Here members of the public brought to the Archive their own commercially taken seaside photographs. At these events high-res scans were taken, where possible names attributed and any additional narrative information also attached. Three years ago and new to the role, as archive director I rapidly had to learn to accept each donation, each encounter with sensitivity, respect and time. To accept that community collection days would be slow-paced day and to understand that each image donor told the picture’s narrative not as history – but as memory. Maurice Halbwach’s persuasive thesis is salient here, drawing as it does a distinction between that of history and memory. At the Archive we have become very aware that for image-donors their contributions are not considered by them as ‘history’ – they’re neither a formal nor a written account mediated through the academic or official lens. These modest material objects are potent visual connective tissue linking the donor to their (re)membered past. The connective tissue between their reality of now and their (re)membered experience of then. Using the medium of these commercially taken seaside photographs we at the Archive seek to capture that connective tissue between photo-donor and their knowledge, their understanding of this (re)membered past. It is inevitably a selective and reconstructive process where distortion does take place, whereby through (re)membering a past rather than The Past and a truth rather than The Truth is produced. A past and truth made all the more binding through the act of telling at the community collection event. In undertaking this work, the Archive not only catalogues the donation, but also documents and notes how these images provoke memory and behaviours in the donors. This proposed paper will reveal how donors repeatedly hold the photograph with a pronounced tenderness and/or stroke the picture as if a relic. We witness how such prosaic photography has material potency – a material potency which arguably supersedes the photographer’s original intention. Abstract: This illustrated presentation considered how CCCU's Centre for Research on Communities and Cultures has been utilising the seaside to gather together various communities living along the Isle of Thanet's south east coastline. These curated gatherings seek to offer voice to those who often and understandably feel placed at the margins. 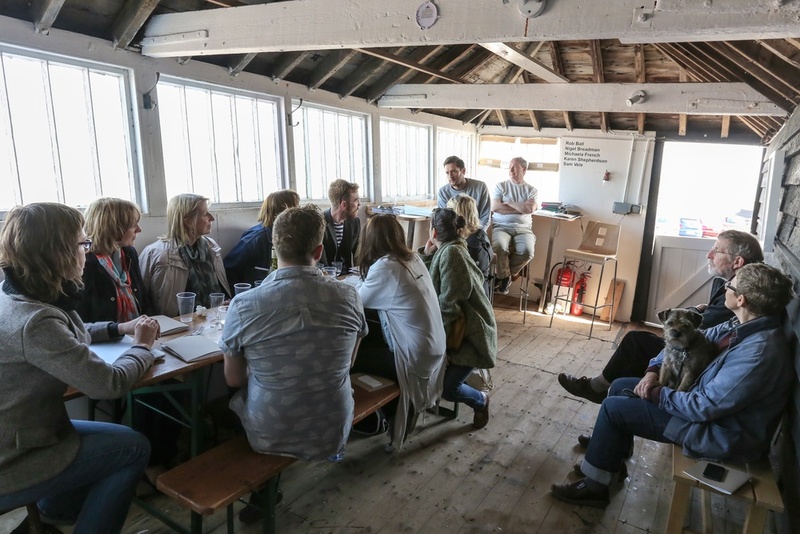 Through public events and exhibitions the Centre for Research' seeks to enable the sharing of narrative histories and experiences to take place within a site of play (the seaside and the water's edge). Through the case study of 'Seabathers: Reflections and Responses' new understandings can be established, misperceptions repaired and the space of Thanet reimagined. This illustrated paper provided insight into the practice of commercial seaside photography, offering a visual exposition of the British seaside as represented through the refracted lens of the female beach photographer. The research upon which this paper was based provides new insights into an overlooked form of demotic photography and the role women played in this commercial practice, thereby opening up rich seams of imagery and revealing new perspectives on photographic working methods. 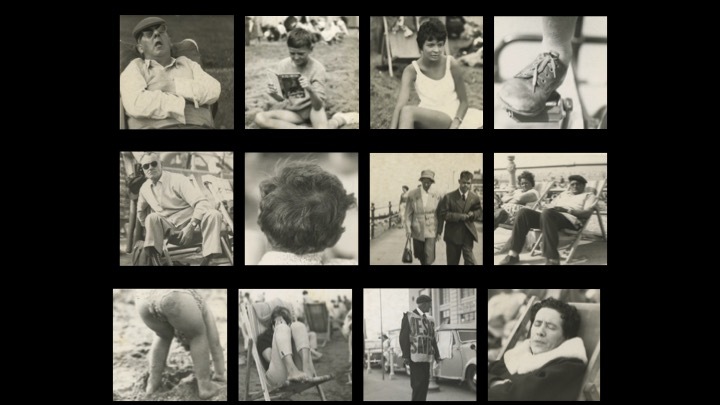 This paper examined commercial seaside photographic practice, offering an exposition of the British seaside photographer as she evolved from the itinerant individual to resident employee within an organised structure. The role of seaside photographer had in its early history been couched in derogatory terms such as ‘Smudger’ or ‘Bodger’ and generally and regardless of gender regarded as an inept and relentless seaside pest. Seaside photography companies such as Sunbeam on the Isle of Thanet and Barkers of Great Yarmouth provide examples of large commercial photographic companies located at the coast, which from the 1920s strategically sought to counter the negative connotations surrounding the seaside photographer. One way in which they sought to revise public perception was through the employment of articulate, attractive and proficient women photographers – projecting an overt professionalism cloaked in femininity and informality. The history, politics and aesthetics of commercial seaside photography remains a largely overlooked form of commercial practice and amplified still further is the lack of examination of women’s location in this practice. Within commercial seaside companies, women were always present, but predominantly marginalised to backroom tasks of quality control, retouching, administration or, in the public sphere, as kiosk attendants. However, a number of women did become seasonal seaside photographers. Case studies, interviews and visual research show how their practice differed from highly standardised means of production and how this differentiation was harnessed by the women in order to achieve commercial success and recognition on their terms. This was despite the motivation for their initial employment arguably being rooted in the employer superficially considering how attractive young women could function as a hook for holidaying clients to purchase cheap commercially taken seaside portraits. Not only were these young women photographers producing photography that equalled their male counterparts in both method and aesthetic the women’s photography as this research reveals, differentiated itself and provided an alternative visual voice. The paper’s subject, whilst seemingly esoteric and even prosaic, nevertheless importantly illustrates how women have harnessed photography and photographic practices as a mode of not only expression but also as means of physical liberation and economic self-sufficiency. Hostile waters: the beach photographer as endangered species. Abstract: This paper as part of the Margate PhotoFest (2015) placed into context the significant cultural role the seaside photographer has had in documenting and refracting back the beach experience. From as early as the late 1850s itinerant seaside photographers were located on the UK beaches and along with early examples, the presentation considered how the experience of the beach photographer evolved through three ages of seaside photography: early, high and contemporary and also what the future might hold for the photographer working the sands in the modern era. Abstract: This illustrated artist paper sought to provide insight into contemporary creative practice-based research, exploring themes of human ruin, (re)membering and remembrance. In doing so, the research specifically examined and contextualised the photographic series Aftermath (Shepherdson, 2014) which was commissioned to commemorate the centenary of the First World War’s start. Aftermath in reappropriating the found images of Ernst Friedrich’s 1924 Krieg dem Kriege examined ‘ruination’ relating to the human form, a form all too vulnerable to mechanical warfare. In addition the paper discussed how physical vulnerabilities might be translated forcefully, yet simultaneously tenderly, through images of the damaged human face. The presentation demonstrated Aftermath’s use of the esoteric photographic technique of emulsion lifting, whereby the photographic emulsion - similar to that of a fine layer of skin - is lifted away, re-echoing the fragility of the face and the utter devastation at its loss. As Sally Minogue comments “The damaged face was one of the most difficult disfigurements for a surviving combatant to bear because of the public response of disgust and rejection, as well as the sufferer’s own deep loss of confidence and sense of identity. In facing Shepherdson’s photographs we take on a responsibility to face up to what modern warfare means” (2014:23). A characteristic of emulsion lifts are tears and creases which subsequently require slow, gentle teasing and stroking out by hand using soft natural bristle brushes. This act of stroking and easing the face back into shape is of course in sharp distinction to the moment of facial destruction. The specificity of this process also limits scale and thus distils each work into a unique artefact with consequent ‘flaws’ accepted and welcomed. In considering photography’s potential to connote human fragility and ruin, the paper will draw upon the salient writings of Derrida, Sontag and Berger. Abstract: Aleida Assman stated that ‘the archive…can be described as a space that is located on the border between forgetting and remembering’ (2008:103). Both are selective processes that forge meaningful terrains and bring order to isolated artefacts. ‘(Re)membering’ is a slightly ironic concept that attempts to encapsulate the archival processes of collection and collation, synthesising disparate parts into a meaningful whole. The Sunbeam Photographic Collection is an example of this - consisting of more than 40,000 commercially taken British seaside photographs from 1917–1976. Their origins are private individuals and uncollated municipal holdings and it is the role ofthe South East Archive of Seaside (SEAS) Photography to construct an ordered collection from such disordered parts. The archivist’s meaningful terrain represents a perspective which can be at odds with users and contributors. ‘Remembrance’ refers, in this context, to the emotional meaning that such ‘holiday snap’ images have for the non-archivist, interpreted through the lens of selected memory. For the archivist, such nostalgia gives way to categorical synthesis and academic analysis, in which technical, historical and cultural contexts predominate. Thus, far from a neutral interpretational landscape, this Collection can be regarded as a locus of contrasting and perhaps conflicting perspectives. For some contributors, key Sunbeam' images represent a canon, with overt sanctification. Accordingly, the archivist can be seen as hijacking the demotic, taking the ‘people’s pictures’ and over-intellectualising them. A central problem to be discussed is, therefore, how this nexus of conflicting perspectives is navigated/negotiated, without alienating the very people whose contributions are so vital to the archive’s formation. Abstract: In examining how walking informs my own work, this illustrated paper will argue for a reappraisal of the parochial and specifically how walking and working close to home can contribute to and inform creative visual practice. Walking to work or – walking to make pictures - was dually provoked by a growing sense of (dis)ease with the amount of time I was spending studio and screen based and also by my home town making the front cover of the Monty Cantsin’s Greetings From Shitsville UK. By drawing upon earlier writings by John Piper, Benjamin Britten and Stevie Smith, I came to realise I had capitulated far too soon to slack assumptions that my parish was a creative wasteland (or from Cantsin’s perspective - ‘shitsville’) and that by retreating to the studio and screen I could somehow cunningly circumnavigate parochial perils. The parochial too frequently connotes the mundane, the insular, the unaspirational and a concern for the fundamentally ordinary. Such a stance is amplified still further when the local is a prosaic town on an unromantic Isle commonly referred to as Thanitos – Isle of the Dead. Initial creative recalibration to the local produced work such as Landscape with Fragmented Forms signify the fractured relationship I was experiencing with place and space as I walked the Isle. But over time, the pedestrian rhythm of daily walks to work brought not only space to think but also a realisation that my once dislocated practice had relocated to be profitably close to home. As Piper would argue, I had shifted from being on to being within the landscape The outcome, as this paper will explore, has been the long-term photographic project The Jettywhich adopts a perspective that is at once subjectively ‘at home’ and yet non-subjectively placed at an observational distance. Abstract: The research upon which this illustrated paper is based seeks to provide insights into a somewhat overlooked form of demotic photography: the seaside ‘walkie’ or commercial seaside photograph. The research specifically examines the Sunbeam Photographic Company located in Margate, UK until the mid-1970s and whose vast collection of glass and celluloid negatives is currently being digitised at the South East Archive of Seaside (SEAS) Photography. The Sunbeam collection is providing a revealing and rich seam of imagery and offers new perspectives on commercial seaside photographic practice and technique. This illustrated paper examines the Company’s commercial photographic practice from 1920-1970, offering an exposition of the British seaside photographer as s/he evolves from the itinerant individual to resident employee within an organised structure. The role of seaside photographer had often been couched in derogatory terms such as ‘Smudger’ or ’Bungler’ and generally regarded as an inept and relentless seaside pest. Yet Sunbeam provides an example of a commercial photographic company located at the coast, which strategically countered the negative connotations orbiting the seaside photographer. Sunbeam sought to revise public perception through a variety of methods including the employment of articulate, well-groomed and proficient photographers – both men and women – projecting an overt professionalism cloaked in informality. A system was devised by Sunbeam that was calculated to standardise customer experience and where differentiation of that experience occurred it would be safely located at the margins. For example, through the benign use of elaborate props such as stuffed lions, bears and tigers; large Disney figures; or farcical ersatz elephants, donkeys and dogs. The consequences of this standardisation are arguably images, which facilitate an increased informality by the sitter(s) and whereby the prosaic pictures produced resonate still with the contemporary viewer- signifying the very potency of photography, in making the past present again. Good Morning and I am so pleased to have been given the opportunity to talk about the work we have undertaken through a Futures Initative Award. The Department of Media, Art and Design at CCCU – and specifically the Photography Programme - has benefited from F.I. Funding. The award has allowed us to purchase a bespoke Yurt or to give it its true name - a Gur- a tent that has been used subsequently as both mobile darkroom and camera obscura. Firstly, prior to the award being made, the taught Photography Programme, whilst principally teaching using cutting edge digital equipment, nevertheless had a strong curriculum strand which examined traditional – not digital – methods of light and image capture. Importantly as a teaching team we never promoted this as a means of constructing an opposition to contemporary digital practice – never for example connoting one as superior to the other, it wasn’t film vs digital! - rather we sought to reveal through practice, that innovative and creative technologies had been utilised by image-makers long before the arrival of digital screens or electrical power supplies. Indeed the analogue has of course influenced much of our contemporary digital practice and our digital discourse. But, prior to the yurt, all of this learning took place on and within CCCU’s satalite campus. The Campus is very limiting in terms of being creative environment; it is very technology driven with almost all of our teaching spaces filled with divine macs and this technology is then added to with undergraduates - and of course tutors - arriving with their own macbooks, smartphones and ipads etc. The idea for a yurt as mobile darkroom and camera obscura is a plagiarised one... I was already very familiar with the photographic artist Abe Morrell. Abe has produced work using camera obscuras in beautiful, luxurious hotel rooms in Venice / New York / Sydney… London etc. But he too yearned to leave the constructed and go back to a more basic approach. And here is what he calls his ‘camera tent’ in Florence and this other one is in NY. The tent has a lens right on the top and this brings in the outside – refracted into the tent. And this on the right is what Abe is seeing and then photographing on the floor of the camera obscura. Notice all the artefacts on the image – he uses the ground where the camera tent is placed as the base for the image-making. So, if the pavement is marked these marks are seen in the final picture. Likewise if he used the tent in a desert the sand would be visible – thus the place and space of image–making is pushed to the fore. So, we commissioned a yurt and we initially built our own lens to allow the outside in. This wasn’t as bright as we had hoped and in the following year we were awarded some more funds to buy a bespoke lens for the camera obscura. So how have we actually used it? As noted in the film, the yurt is used as both camera obscura and darkroom by our Y1 photography undergraduates as part of their curriculum; it is used by our Part II students (Y2 and 3) for individual projects. They can book it out and take it off site to work. And it has been used by the Programme teaching team as a form of KE and community engagement. As photography tutors we have the annual joy of seeing numerous students working in the darkroom for the very first time. If you have never experienced this yourself it might be difficult to imagine – but there remains something magical about being in a darkroom – with a little bit of red safety light to help you see where you are going. As a tutor, you see a student slip for the first time a piece of exposedphotographic paper into the development tray and there, in front of their eyes their image begins to appear – at first a hazy suggestion and then as the seconds and minutes tick by, up and up it comes into the recognisable image. The first time this happens students will often gasp or giggle in sheer delight. Any pretence of cool on their part is jettisoned. It’s chemistry – but in those early moments it feels magical. The yurt has taken that experience and amplified it. It abstracts the user – be that tutor, student, curious member of the public who happens to be passing by, school group – who ever – but it abstracts them… If demonstrating the camera obscura we first enter into darkness. A total – can’t see the hand in front of your face darkness – the initial response is normally one of noise – whoops of excitement / expletives as someone knocks into or treds onto their near neighbour – a little bit of silliness – and we just wait. Over the chatter we quietly introduce the large disc on which the image will be reflected and ask that all those inside the Yurt take hold – someone inevitably always says ‘it’s like a séance’ and that creates another wave of silly spooky sounds and excited shrieks – but we know these will settle. And then, then there is quiet and we wait – we seldom have to even encourage them to hold this silence – they have moved into a different frame of mind and we stand in the darkness / in the silence and we are stilled. At that point one of us quietly reaches up and opens the lens and the outside is bought in. Regardless of how prosaic the location, the result is always the same – no more excited squeals / no more expletives – but gasps and then quiet almost reverential discussion of what is seen. The world – their world is made strange – they are literally placed within the camera. That experience has a legacy – after use the students, most of whom of course will elect to work principally digitally, not only have a respect for past technologies, but also an understanding of where much of their own digital practice and terminology is rooted. 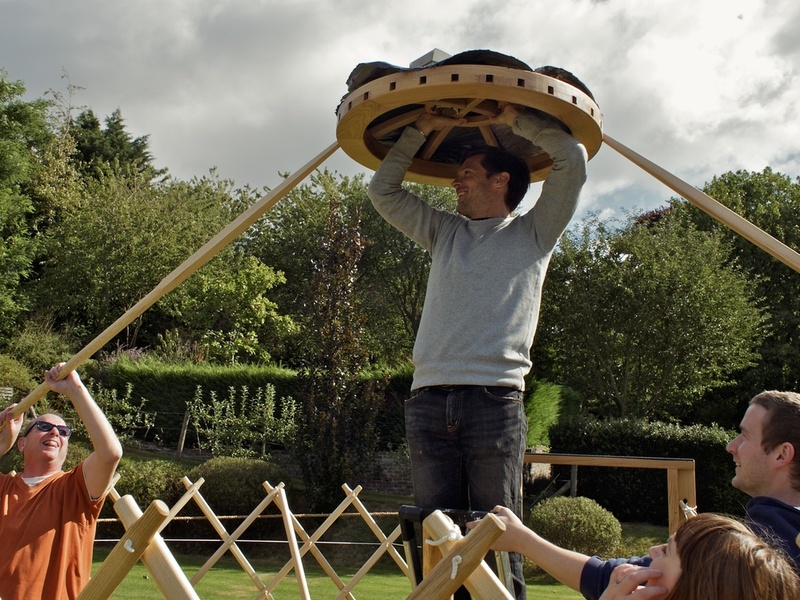 And for those students utterly seduced by the experience they then have the knowledge and understanding to make use of the yurt and to bend this extraordinary resource to their own creative needs and purposes. For us, this award - this resource- fascilitates the presence of the past into contemporary and future practice. Abstract: For the latter part of the 19th and much of the 20th Century, commercial photographers represented and reflected the heritage of British seaside culture. The research upon which this paper is based, seeks to provide insight into an overlooked form of demotic photography, revealing rich seams of imagery and offering fresh perspectives on Victorian coastal representations. The paper examines commercial seaside photographic practice from 1860-1920, offering a visual exposition of the British seaside, as represented through the refracted lens of the itinerant ‘beach’ photographer – also often derogatorily referred to as a ‘Smudger’. Despite their humble means of production, the photographs shown are frequently evocative, drawing the viewer into a nostalgic past shaped by visual half-truths. Photographic half-truths that too readily can become amplified from a view to the view and to the experience. The research presented here examines the conventions, expectations and mythologisations of what seaside portrait photography of this period should present and how these inevitably provide a highly mediated and edited view of the actual Victorian seaside experience. Here I attempt to reframe and recontextualise these ‘seaside snaps’, providing visual and text-based content that rewards both scrutiny and critical engagement.